One of the greatest defensive fighters of all time, Young Griffo compiled an outstanding record while eschewing traditional training methods. Born in Australia, the illiterate Griffo got his first experience fighting while selling newspapers on the docks of Sydney. When noted Australian boxer Larry Foley saw him in a street fight, Foley added Griffo to his stable of fighters. 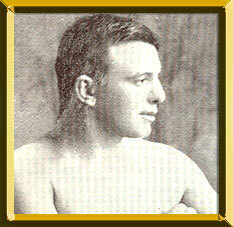 Griffo first started boxing under the old London Prize Ring Rules in 1886. In 1889, Griffo won an eight-round decision over Nipper Peakes to take the Australian featherweight title. The next year, he scored a fifteenth-round knockout of Torpedo Billy Murphy in Sydney to win a version of the world featherweight title. Though Griffo successfully defended this title once, he did not gain widespread acclaim as the title holder. In 1893, Griffo journeyed to the United States and dazzled fans with his incredible ability to avoid getting hit. He used to boast that he could stand on a handkerchief and dodge punches without taking a step in any direction. Griffo fought a host of notables, usually competing as a lightweight, although he did not earn a title shot. He fought three draws with George Dixon, which could have gone Griffo's way had the rules allowed the rendering of a decision. He also lost a controversial decision to Hall of Famer Jack McAuliffe, who barely touched Griffo in ten rounds. Griffo did not treat his boxing career seriously. Usually, he did not train at all for his fights. If legend is to believed, he often arrived in the ring drunk or hung over. Even so, he was able to win more than his share of fights while absorbing only a minimal amount of punishment. By 1900, the years of hard living had slowed Griffo, and he suffered a knockout by Joe Gans. Griffo continued to fight until 1904 and made an abortive comeback in 1911. In retirement, the hard-drinking, wise-cracking Griffo used up his fame and money until he was reduced to panhandling in Times Square. He became a familiar figure, spending his days perched on the steps of the Rialto Theater. When Griffo died in 1927, promoter Tex Rickard reportedly paid for the funeral.